Ladislas Lubomirski (1824-1882), a Polish nobleman, had an interest in natural history and contributed to Neotropical malacology. He wrote only one paper on Peruvian land shells (Lubomirski, 1880), which was based on collections made by K.R. Jelksi (1837-1896) and J. Stolzmann (1854-1928, also written as Sztolcman); they travelled through that country in 1870-1874 and 1875-1878 respectively. The shells collected during their trips are kept in Lubormirski’s collection, which is in the Warsaw museum. In Lubomirski’s paper, several new species are described, two of which belong to the Orthalicoidea: Bulimus (Orphnus) jelskii and Bulimus (Porphyrobaphe) wrzesniowskii. Dominika Mierzwa-Szymkowiak (Museum i Instytut Zoologii) kindly located the type specimens for me and made some photographs. For completeness sake I have also made copies of the original figures. The first species is now classified as Thaumastus (Scholvienia) jelskii; it was described from Dept. Junín, near Tarma, Amable Maria (-11.168462 S, -75.355516 W). Weyrauch (1964) redescribed this taxon on the basis of new material from the same region. According to his data this species occurs at 1400-1800 m; it may be closely related to species living at higher altitudes, e.g. T. (S.) tarmensis (Philippi, 1867). The labels show that Lubomirski was in correspondence with Crosse, who considered this shell as a novel species. The green label has Lubomirski’s handwriting. The second species, described by Lubomirski from “Tambillo”, is now classified as Sultana (Metorthalicus) wrzesniowkii. The type locality, however, is somewhat puzzling as there are several localities of that name in different parts of Peru. Without further knowledge of localities where Stolzmann, who was an ornithologist, collected birds, it will remain difficult to pinpoint this place. In the original figure the top of the shell seems to be missing in the ventral view. However, the label leaves no doubt that this is the (single) specimen which Lubomirski had at hand. Lubomirski, L. (1880) Notice sur quelques coquilles du Pérou. – Proceedings of the Zoological Society of London 1879: 719-728. Weyrauch, W.K. (1964). Nuevos gastropodos terrestres y nuevos sinonimos de Sudamerica, II. – Acta zoologica Lilloana 20: 33-60. This entry was posted in Uncategorized and tagged biohistory, peru, sultana, thaumastus, types on November 18, 2013 by bramb. 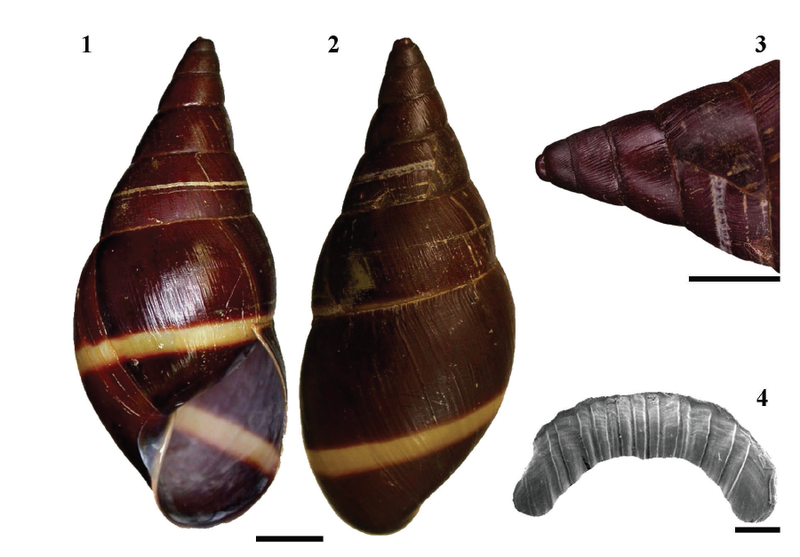 Vasconcelos & Pena (2012) recorded the second specimen known for the rare Brazilian snail Thaumastus caetensis Pena, Salgado & Coelho, 2011. The specimen was found in de Serra da Piedade, Caet? ?, Minas Gerais and its presence in a protected area is important. This species is probably restricted to the ‘campos rupestres’ habitat. The (subadult) specimen was found alive, but preserved in formalin, which makes it unsuitable for DNA research. This entry was posted in Uncategorized and tagged brazil, ecology, literature, thaumastus on November 12, 2012 by bramb. This picture was taken during bird-watching in the Jorupe Reserve in southern Ecuador. This Fundación Jocotoco reserve on the border of Ecuador and Peru, consists of Tumbesian dry tropical forest. On one of the trees this large species was spotted, which bears some resemblance to Lissachatina fulica. Fortunately, this is not the case; it is a Thaumastus species, which is difficult to identify without additional pictures. 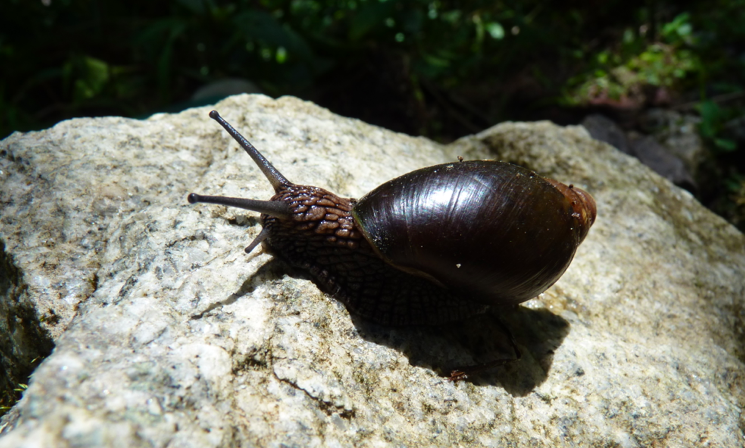 Anyway, a nice picture of a beautiful snail from an interesting locality. Thanks to Kate Richardson for sharing! This entry was posted in Uncategorized and tagged ecuador, thaumastus on July 28, 2012 by bramb. A paper with a description of a new Thaumastus species from southern Brazil has just been published (Colley, 2012). It describes a new species from Paran? ?, S? ?o Jos?? dos Pinhais e Guaratuba, Hydro-electric Powerplant Guaricana, Thaumastus straubei n.sp., for which also the anatomy (mandibula, radula and genitalia) is described. The holotype is in the Rio de Janeiro museum (MNRJ 11890). Colley, E., 2012. Nova esp? ?cie de Thaumastus da Floresta Atl? ?ntica do Paran? 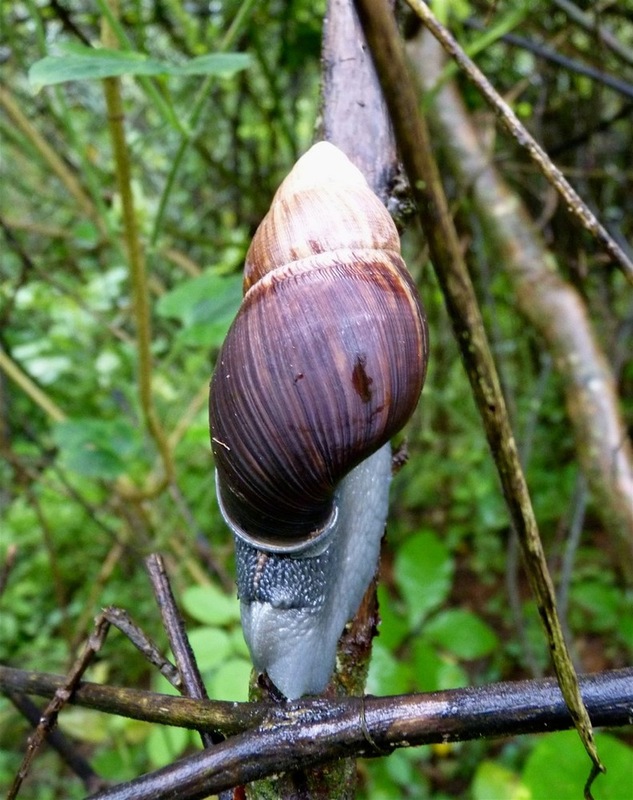 ?, Brasil (Mollusca, Gastropoda, Pulmonata, Bulimuloidea). – Iheringia 102: 43-47. This entry was posted in Uncategorized and tagged brazil, literature, thaumastus on May 21, 2012 by bramb. The last stop on my trip was Peru, where I especially followed the ‘Gringo Trail’ (Arequipa, Puno, Cuzco). In the latter area I visited some of the touristic highlights, e.g. Machu Picchu and the ‘Holy Valley’ (R? ?o Urubamba valley). Some of my old localities (1975) were revisited and the same species were still abundantly present. 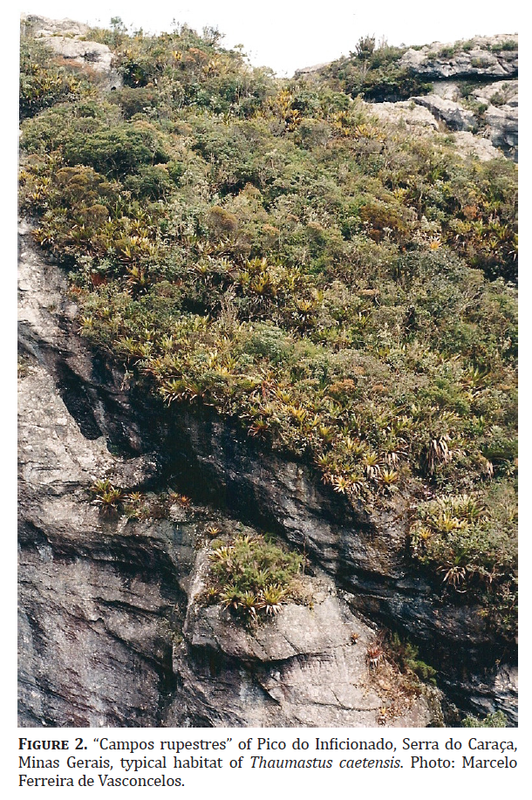 E.g., near Pisac Bostryx spiculatus (Morelet, 1860) was observed on vertical rock-faces near the road. Just opposite Urubamba Bostryx tubulatus (Morelet, 1860) was observed in xerophytic vegetation, hibernating on dead twigs and on small bushes. Near Ollantaytambo Bostryx cf. virgultorum (Morelet, 1863) was found among boulders on a slope with xerophytic vegetation, under and near stones. Finally, near Aguascalientes a – yet unidentified – Thaumastus species was found aside a path. This entry was posted in Uncategorized and tagged bostryx, peru, thaumastus on April 1, 2012 by bramb.